Matthew J. Crawford described the following about the origins of Fort Henry. "The War Department had determined to erect sea coast batteries along the Gulf Coast. To any towns that they might select as advantageous. They offered, provided the community furnished the land, to equip and build the fortification. At a special meeting of the club, this matter was taken up and it was enthusiastically resolved that "we" as members of this club "would compete with neighboring towns for the honor of possessing a fortification all our own." A subscription list was started and in a short time the amount necessary to purchase a tract of ground was raised. Henderson's Point at the extreme end of the village, was the place selected. Word came from Washington that the Department had decided to accept our proposition and the necessary work was at once begun. "Major Rockwell, an engineer of the army, shortly arrived and then we all got busy. A day was set for the inauguration of this colossal enterprise, the armament consisted of one old smooth, bore cannon that had probably seen service during the War of the Revolution. One of the militiamen remarked that "it was a sure enough cannon all right, although we never tested it for fear of its bursting and thereby causing us untold anguish, for we knew that the government would never replace it." "The fort was named in honor of Adjutant General William H. Henry of Brandon, Mississippi, a descendant of Patrick Henry, one of the signers of the Declaration of Independence. The Fort was constructed of clay with timber re-enforcement. It was equipped with 8-inch mortars backed up by two 10-inch Napoleon revolving cannons which were hauled in by the first eight-wheeled log wagons on the Coast. "Well then, everything being ready, the War Department ordered the regular troops stationed at New Orleans to attend the opening ceremonies. 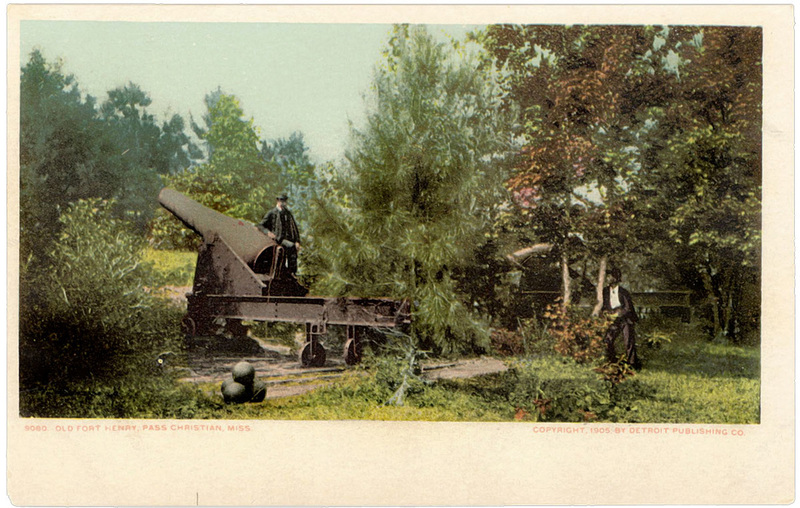 The famous Washington Artillery was sent by the State of Louisiana, as also Benham's Field Battery. Several militia companies from up the State were sent and when they arrived the town went crazy. The Washington Artillery brought with them the then famous Mexican band of sixty pieces: the regulars had a fine one also, and these, with the martial music of the fife and drums, enthused the negroes in such a manner that most of them immediately got drunk. "The hotel did its share to heighten the festivities. A Grand Ball was given in the house and a "fete champetre" with fire works was held on the lawn in front. There never was before, nor, I believe since, seen so much patriotism, so much military splendor and so much jollity as reigned in Pass Christian during the days and nights that the Carnival lasted. "All things must have an end. With the departure of the "soljers" we gradually relapsed to our accustomed dullness. The result of all this left us in possession of some officers appointed from the fact of our having a fortification in our midst. The name of this stronghold was Fort Henry. The favored gentlemen so signally honored were -- Sam'l Heaslip, Esq., who was appointed Brigadier General; John Lang, Esq., who by unheard of efforts, had raised a company of eleven men, including its officers, so, for this achievement, Lang was made Captain; and Charles Rhodes, another member of our club, who owned a general store in town, was commissioned Quartermaster. "The only thing remaining of the tremendous affair is the solitary cannon rusting on the embankment at Fort Henry. But it was a glorious time for Pass Christian while it lasted and well worth the money." The site of the Fort and the grounds make an ideal spot for a military encampment, affording the advantages of transpaortation, both by rail and water, salt bathing for the soldiers, ample gorunds for drilling and campoing, and an abundance of pure artesian water easliy obtainable. 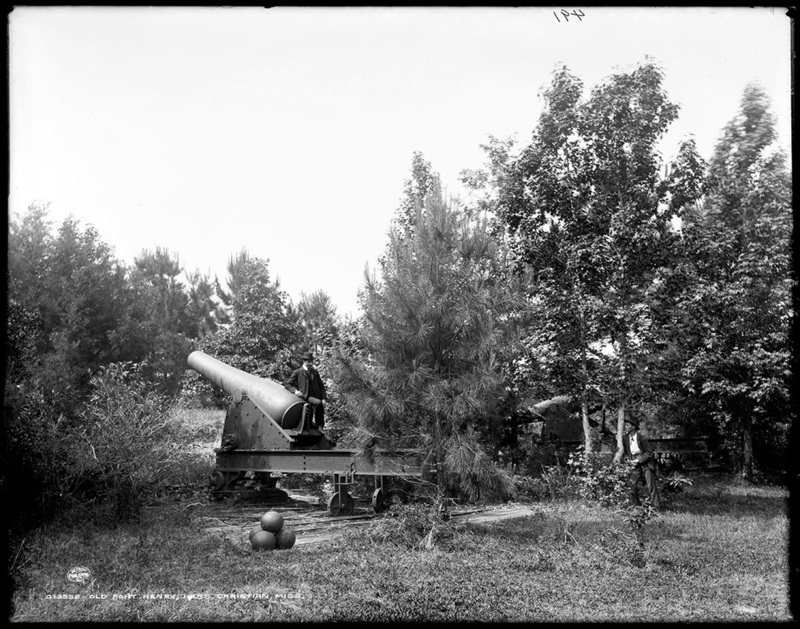 The Fort was constructed of clay, re-enforced with heavy timbers, and mounted with two long 10-inch Napoleon revolving cannon, and four 8-inch mortars. These guns were reportedly brought over from Fort Massachusetts, at Ship Island. In the early summer of 1888, the Washington Artillery of New Orleans occupied the grounds for several weeks, and later in the same year the Thornton Artillery, Pass Christian, (named in honor of the late Colonel J.J. Thornton, of the famous Sixth Mississippi Regiment); the Vaiden Videttes and the Crystal Springs Rifles, under command of the late Colonel E.W. Morrill, then of Biloxi, and Major E.J. Bowers (former Congressman), held the last encampment at the Fort, and since which time, no attention has been given under Captain J. H. Lang for a few years following the last encampment.